The main reason why students are not choosing maths is attributed to not having enough maths teachers but I wonder what other factors might be considered. Is it a matter of an uninspiring curriculum? Or perhaps poor communication between maths and science teachers so that connections between the subjects are not emphasised? It would be interesting to find out. Just what we need in the UK! There has been some discussion going around on various blogs/twitter following two recent publications: Michael Gove’s speech at the Royal Society about maths teaching and Stephen Curry’s article in the Times Higher about maths in bioscience degrees. One particular comment struck a raw nerve with me and referred to “remedial teaching” of maths at university. Yes all of the maths I teach at first and second year university level for biological scientists and medics and vets is essentially GCSE and AS-level maths so let me explain why I don’t consider what I teach to be “remedial”. The short answer is that I’m teaching the maths in a biological context, something which is clearly not done at school. In doing that I’m reinforcing what they have already learned and helping them to understand it at a deeper level (I hope!) I’m helping them to see its relevance and usefulness, again something that I’m not convinced is done at school. All of my students will typically have three A’s at A level though not necessarily in A level maths: they are academically talented and pretty motivated in their studies. I find that some students have done maths A level and done pretty well but will quite openly admit that they didn’t really understand it properly. Others say that they’ve never been “good at maths” and didn’t dare to take it at A level because they’d have a better chance of getting their three A’s in other subjects. There are some things university teachers take for granted that students have not covered at school. For example units (eg mg, min, ml) and how to use them in calculations. I guess some people might consider this akin to dimensional analysis. Students don’t typically include units in their calculations until I force them to. If they don’t then they end up with the wrong answer, usually by a factor of 1000 because they have forgotten a prefix or by 60 if they’ve mixed up seconds, minutes and hours. This isn’t “remedial” because it was never taught in the first place. Like most maths, it’s really obvious once you know it but completely obscure if you don’t. A consequence of this is that it looks like they’re rubbish at maths, and they feel like they are, but they just need to be pushed into writing out their working and answers in a logical way that includes the units and most, if not all, of the steps. I guess this is also a symptom of rushing to get an answer instead of reflecting on what you’ve done and estimating whether the final answer is likely to be in the right ballpark. Having worked with a number of dyslexics and dyspraxics now the importance of getting the maths onto the paper in a sensible, logical manner is often a stumbling block. I wonder how many non-dyslexics/dyspraxics this applies to too. For a multi-step problem it is essential to get the working out onto the page to relieve working memory but for many people it is hard to write in the mathematical language. They can often talk it through but not write it down. They clearly understand it but have difficulty communicating it. What I’m not sure about is how well the writing of mathematical working is taught at school. From where I sit it seems patchy, some students can do it ok whilst others don’t know where to begin. Many mathematicians are so used to the language of maths that they cannot begin to understand how others cannot see what they see. I have seen lecturers in pharmacology present pharmacokinetics or receptor theory as a set of equations and expect students to look at the equation and see what the lecturer sees. If you put an equation on the board, even a simple one, students will typically not see or make sense of it in the way that the lecturer will. At university we bemoan the difficulty students have with logarithms. However only those who have done AS level maths will have been taught about logarithms so it is wrong to call a course at university that covers logs a “remedial” course is wrong if they haven’t done it in the first place. The most difficult part of maths within the life sciences is relating the maths to the biology. The number of times as a student myself I’ve been taken through the derivation of an equation and lost the plot is probably unmentionable. I have even fallen into the trap myself of thinking that if I just go through the algebra of deriving an equation (say the Michaelis Menton or the Schild equation) then students will understand the equation itself. It’s what you say as you do the derivation that’s important. It’s how you help them get an intuitive feel for the equation that makes the difference. So how do you really get an intuitive feel for how an equation is used? My attitude at the moment is to abandon the lecture format and start with students solving problems themselves. My experience is that they really do know the maths but that they need time to absorb and develop the skills to be able to use it. There some nice initiatives going on: eg the TEAL project at MIT see also commentaries on pseudoteaching but as the article about the TEAL project points out, this sort of teaching is really very difficult, it takes time and resource to help the teachers develop the appropriate skills and it will often means that the teacher needs to change their own mindset. (1) to what extent are bioscience graduates equipped with the basic toolkit of mathematical and statistical techniques needed for the least quantitative of the biological sciences? (2) to what extent do bioscience graduates have sufficient maths to understand and participate in research in systems biology and computational biology working in interdisciplinary teams and communicating effectively with engineers, physicists and mathematicians? Following on from these questions: if there is a lack of supply of mathematically-skilled bioscientists what training provision exists to correct this? The driving force for this survey has been an increasing number of reports and remarks regarding problems in the mathematical skills of bioscience graduates. In the current BBSRC Strategic Plan “BBSRC will …. encourage interdisciplinary research and training… as bioscience becomes increasingly quantitative there is also an urgent need to raise the mathematical and computational skills of biologists at all levels. “ The Association of the British Pharmaceutical Industry reported in 2008 that lack of mathematical skill was an issue both for basic bioscientists working in predominantly “wet” lab environments as well as lack of bioscientists with sufficient mathematical aptitude and expertise to work well with interdisciplinary groups using systems biology approaches. The results of the survey will be compiled into a report to be prepared for the UK Centre for Bioscience and made available on its website. There are four short sections and many of the questions are optional. There are spaces for free text responses so that you can qualify or explain your answers. The survey may be completed anonymously though it would be helpful to know your institution to assess the range of types of institution who have responded. It should take about 10 minutes to complete. Skills Needs for Biomedical Research: Creating the Pools of Talent to Win the Innovation, Association of the British Pharmaceutical Industry, http://www.abpi.org.uk/publications/pdfs/2008-10STEMSkillsReviewReportFINALamended2.pdf accessed 8-3-2011. It looks like apparently good news but I’m not convinced that it’s “real”. The proportion of A level students taking maths with the core science(s) is increasing according to the Royal Society report published last week “Preparing for the transfer from school and college science and mathematics education to UK STEM higher education”. 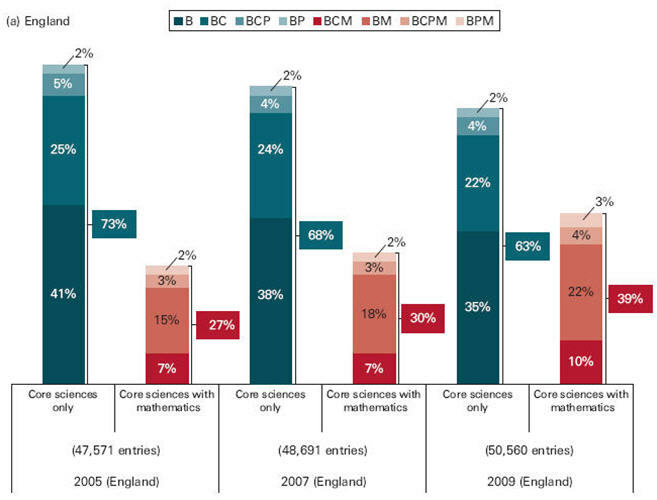 The figure below is taken from this report and shows the proportion of students who take core sciences that include biology (B) (alone or with Chemistry (C) and/or Physics (P)) either without maths (in blue) or with maths (in red). This data is for England but a similar pattern is seen elsewhere in the UK. The left hand pair of blue and red columns is for 2005, the middle for 2007 and the right hand side is for 2009. However, if you add up all the A level students taking one or more of the core sciences (biology, chemistry, physics) or maths there has been no overall change since 2005. Though remarkably the proportion of students who take sciences is much higher in Scotland (~60%) and Northern Ireland (~44%) than England and Wales (34-37%) (this is in table 3.2 of the report). Now if you put this information alongside the data from the report “Understanding the UK Mathematics Curriculum Pre-Higher Education” by Stephen Lee, Richard Browne, Stella Dudzic and Charlie Stripp of the MEI (http://www.bioscience.heacademy.ac.uk/ftp/resources/pre-university-maths-guide.pdf ) which shows the proportion of students taking A level mathematics as a percentage of the total number of A level entries you see a dramatic dip between 2002 and 2005 (I’ve plotted the data from this report to make it easier to see the changes). from “Making Mathematics Count: The report of Professor Adrian Smith’s Inquiry into Post-14 Mathematics Education” February 2004 (http://www.mathsinquiry.org.uk/report/index.html). So this makes me wonder whether the Royal Society’s conclusions are just a result of having started from a baseline at 2005. 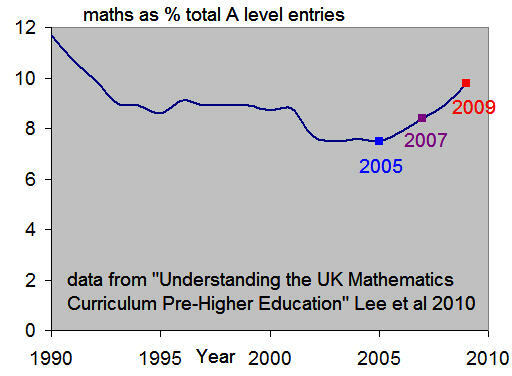 It will be interesting to see if the proportion of students taking A level maths continues to rise or if this is just a correction from the dip seen in 2002- 2005. Convincing prospective and current undergraduates that biology is a quantitative subject. One area of strong consensus amongst those teaching maths for bioscience degree courses is the need to convince new undergraduates in the biosciences that maths is important and useful in biology. By extension there is also a need for better advice and influence in schools to show students and their teachers the important roles that maths plays in bioscience, not just statistics as is a common preconception, but maths in general. There is a lot of material on the internet but I guess finding it all is more than half the battle. So of the pool of A level students, how many of them have studied science and how many of them have studied maths as well? According to the Royal Society’s report released this week http://royalsociety.org/State-Nation-Increasing-Size-Pool/ roughly half of those who took one or more core sciences also took A level maths. If you look at those students who studied A level biology (either alone or with another science) only 40% of them also took A level maths. These figures refer to students in England and similar patterns are seen in Wales and Northern Ireland. Interestingly in Scotland students are much more likely to have taken maths alongside science in Scottish Highers. So it was interesting to see that one of the recommendations in the Royal Society’s report was to move towards a system where students take a broader range of subjects rather than being restricted to (mostly) 3 A levels. If many of the students who currently take sciences at A level without maths could be persuaded to take at least AS maths then this would be an enormous improvement. AS maths introduces students to calculus and logarithms which are two really key mathematical concepts not covered at GCSE. It also reinforces the algebra they learned at GCSE so they are generally more confident and they are more familiar with using scientific notation. Unfortunately there isn’t any analysis of the numbers of students currently taking AS maths with the A2 core science A level(s) as the report comments that the data relating to AS-levels is unreliable (p49, section 4.3.3.3). Hmm… so how many science engineering ambassadors going to schools are biologists keen on maths??? What do school maths qualifications mean for university study? The stories you hear from colleagues bemoaning the mathematical literacy, or lack of, amongst undergraduates. And graduate students too, actually. First a little background. All students in state schools in England (Wales, Scotland and Northern Ireland have different systems) will follow the National Curriculum and GCSE Maths assesses students at the end of their compulsory education (age 16). GCSE Maths can either be studied at Foundation Tier (which allows grades to be awarded between C through to G) and Higher Tier (which allows grades to be awarded between A* through to C). If a student has studied Foundation Tier they will not have covered as much maths as those who’ve studied Higher Tier. The report “Understanding the UK Mathematics Curriculum Pre-Higher Education” by Stephen Lee, Richard Browne, Stella Dudzic and Charlie Stripp of the MEI (launched by the Engineering Subject Centre and available on their website as well as at http://www.bioscience.heacademy.ac.uk/ftp/resources/pre-university-maths-guide.pdf ) has a rather sobering list of the knowledge and skills which are NOT covered by Foundation Tier students. This list drew a sharp intake of breath and a communal sigh at the meeting “Mathematical Challenges for Biologists” organised by the Centre for Bioscience, The Higher Education Academy and held at the University of Reading Nov 2010. Many of the participants, mainly those teaching maths at first year university bioscience courses, recognised this description and had their suspicions confirmed. It’s also worth noting, as Lee et al point out, that students with a B or C at GCSE Maths who have studied the Higher Tier will have an incomplete understanding of many of these topics. What this means in effect is that someone with a B at GCSE maths may have limited ability to manipulate numbers commonly used in biology such as measurements made in microscopy in micrometres or concentrations in nanograms per litre. They are also unlikely to be able to recognise an equation for a straight line and may not be able to rearrange it. If they begin study of statistics at University level, they are unlikely to have a grasp of the basics of probability. This is fundamental stuff. Logarithms and exponential decay are just not covered at all at GCSE level and this has important implications for the study of biochemistry, pharmacology and physiology where logarithmic scales are commonly used. Another aspect worth noting is that much of the assessment of this knowledge is fairly formulaic with questions being relatively short and staged, leading the student almost by the hand. Changes to GCSE’s in Mathematics coming up in 2012 may help with this as there will be more emphasis on problem solving and hopefully some more challenging, longer questions. So what does this mean for students studying bioscience at University? It means that either Universities require AS Maths for entry to Bioscience degrees OR for students with GCSE Maths there must be some provision for learning these essential tools and concepts. They must know about logarithms and be able to use them. They must be able to recognise equations for straight lines, hyperbolae, exponential growth and decay and they must be able to rearrange these equations to get out the information they’re looking for. They must be able to manipulate very small numbers in scientific notation and calculate concentrations and dilutions. Without this level of mathematical skill, I believe, students should not graduate as scientists.